Walkthrough: After making it through a White Wormhole in Ultra Space, you will arrive in Ultra Megalopolis, the city where the Ultra Recon Squad resides. 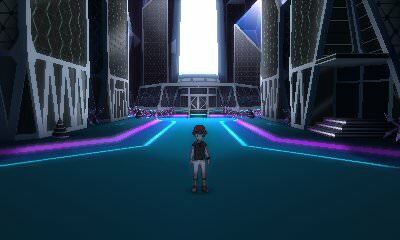 When you first arrive, there will not be much to city besides a path that leads to Megalo Tower where Necrozma can be found. As you approach the tower, you will run into more members of the Ultra Recon Squad. These two will briefly tell you the story on how Necrozma was once called the Blinding One because it would share its light to those who needed it, including the ancestors of the Ultra Recon Squad. However, after their ancestors continuously took advantage of Necrozma's gift, the creature had no choice but to take the light that was ultimately taken from it. After this little bit of history, you will then ascend Megalo Tower to once again battle Necrozma.